Sometimes after a long day at the beach – surfing, swimming, or just soaking up some sun (safely, of course!) – gathering with your fellow holiday mates at one of the Byron Bay pubs makes for the perfect end to a day. When you’re on a holiday, it’s hard to know which are the best pubs in Byron Bay; after all, no one wants to waste money or be stuck in a terrible bar all night. So we did the research for you and offer up a few suggestions on the best Byron Bay pubs to share a cold brew with your mates. Of course, one of the best pubs in Byron Bay is a place where beer is made; it just makes sense. Try out any of the house brews like the Byron Bay Pale Lager or Pilsner or Billy Goat. You even can take a tour of the brewery and get a deal on a beers and a meal (yes, there’s a restaurant attached to the Byron Bay Brewery in case you want to make a full night of it!). The tour is 4pm everyday, but you must book three days in advance for a weekend tour. Call it The Rails, and you’ll sound like a local. But this top pub in Byron Bay’s real name is the Railway Friendly Bar, named for the fact that the bar happens to be an old railway station, right next to old railway tracks. Come to this former railway pub in Byron Bay for an evening to enjoy live music – in fact, the bar claims that it is the only pub in Australia that has featured live music every night of the week for 30 years. Three local guys established this independent brewery in 2008 and have since opened a second location in Murwillumbah. While most of the beer is now brewed in the second location, the Byron brewery is home to the pilot series and other limited release beers. The brewery makes four beers all year long, as well as seasonal, limited edition and the latest addition – the pilot series. Visitors can take a tour to see how the beer is made, as well as sample the beers. The tour takes about an hour. It costs $20 and requires a booking. If you’re more in the mood to just sit and try a few beers, stop by the brewery and ask for a tasting paddle. Or if you’re on your way to the beach or back to your campsite, you can drop in for a carton. One of the reasons this pub, located in the hotel and known as Top Pub to locals, continues to be listed on the best pubs in Byron Bay is the terrace. It’s one of the best places in the heart of Byron Bay to sit, have a drink and enjoy views of the ocean (the location opposite Main Beach helps with the scenery). The large beer garden features shaded tables and bar tables as well as grassy areas. Plus, if you want to stay on a Thursday, Friday or Saturday night, you’ll notice the atmosphere change as the live music or DJ starts. The best of both worlds – an excellent place for a cold one and a fun evening out! Located not far from Byron’s Main Beach and with great views of the streets of town centre, visitors to this restaurant and bar will enjoy plenty of fun people watching. Be sure to check out the special events, like the daily Sunset Happy Hour from 4 to 6 pm where you can sip on $6 Stone & Wood, cider, house wines and spirits. Or check out the Sunday night special, “Booze, Food and No Shoes,” where you can nosh on seafood paella, take advantage of happy hour specials and listen to live music. If you really love surfing, come to Woody’s, a favorite Byron Bay pub with a vintage-feeling and well-known local hangout. It’s a great place to grab happy hour drinks after surfing all day or enjoy a fun night out at one of the Thursday night light and sound shows. On Wednesdays they have a surfboard giveaway – every purchase enters you for a chance to win a custom Morning of the Earth surfboard. Wouldn’t winning make for a memorable Byron Bay holiday? Look here for your sports bar needs. Located in the middle of town centre, the Sticky Wicket would be a fun place to hang out with your mates during your holiday to grab a beer. Beyond being a sports bar, the Sticky Wicket also maintains a reputation as an excellent place to dance! Dance the night away to top 40 and other popular music or come early and grab a cheap meal with your cocktails. Offering up live music almost every night, this relaxed, vintage hotel (also known as the Great Northern) is another one of the best pubs in Byron Bay. Come here to sip on good beers, people watch – if you can grab a window seat or an outdoor table – and catch some excellent bands. It also features good food at good prices, so feel free to come early and stay for the whole evening. Keep in mind, The Northern also features a bottleshop, reported to be one of the best around with more than 250 beers and ciders and over 500 wines from local, national and international sources. A great place to stop if you want to have drinks and a meal on the beachfront! Live music and beer just go together. Head to Treehouse on Belongil, just off the beach, and order a cocktail that you can drink while listening to any of the great acts that this establishment brings into Byron Bay each week from Thursday to Sunday. With an extensive list of cocktails, wine and beer, the Treehouse provides patrons with plenty of options, and with a lovely outdoor area, you can drink your chosen cocktail taking in the beauty of your Byron Bay surroundings. Looking for the place to party in Byron Bay? Try out the Cheeky Monkeys. Cheap eats, cocktails, theme nights and prizes are all on the menu when you come to Cheeky Monkey. Definitely not for the kids, but Cheeky Monkey would make a great spot for you and your mates to listen to DJs and think about participating in the contests. You can’t miss the Cheeky Monkey since it is located on Jonson Street, the main drag of Byron Bay. Located just 15 minutes from Byron Bay, Bangalow is worthy of a day trip for a variety of reasons, but if you decide to stay into the evening, check out the Bangalow Hotel. This renovated 1940s hotel pub features a lounge area complete with an open fire for chilly nights, a traditional bar to watch sporting events and even a live music room with pool tables. Outdoors you’ll find a large enclosed deck to enjoy the good weather. Book a stay with us for your Byron Bay holiday now! If you happen to be reading this whilst on a break in the office, you are probably imagining how great that cold brew would taste. 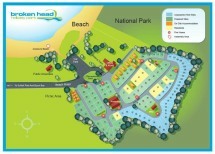 Don’t wait, book your holiday with Broken Head Holiday Park now and make that daydream a reality. We’re the perfect budget accommodation in Byron Bay to make the most out of your travel dollars and have plenty leftover for a drink at more than one of these best pubs in Byron Bay!